Is Technology Making Our Kids Less Empathetic? A UK psychiatrist and former literary scholar at Oxford University has claimed the ubiquity of technology is making young children borderline “autistic”, compared to previous generations. Dr Iain McGilchrist believes the significant time many young kids are spending with smartphones and tablet devices has resulted in children as young as five struggling to read others’ emotions and being less empathetic. Speaking to The Telegraph, Dr McGilchrist said he had a growing awareness of teachers needing to explain to their students how to make sense of human faces. Kids are “increasingly finding it difficult to communicate at an emotional level in what appears to be features of autism,” he said. “Children spend more time engaging with machines and with virtual reality than they used to in the past where they don’t have to face the consequences of real life,” he told The Telegraph. In Australia, the debate has raged over the appropriate age to give children smartphones and how much time they should spend using them each day. 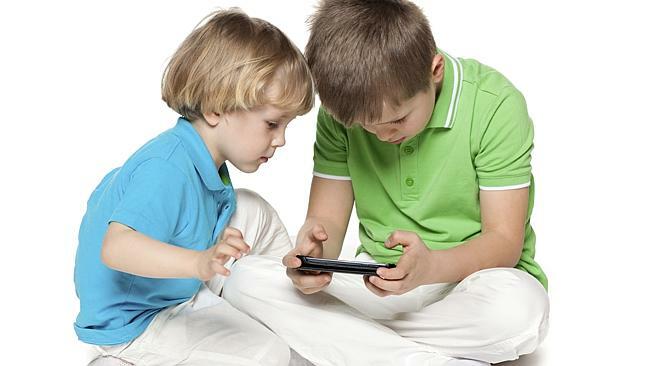 Research released by Telstra this year showed that more than two thirds (68 per cent) of Aussie children aged three to 17 own a smartphone and spend an average of 21 hours and 48 minutes per week on the devices. Sydney-based family researcher and father of six Dr Justin Coulson recommends a minimum age of 12 or 13 for children to be given a phone. “And then make it a dumb one. Smart parents give their kids dumb phones,” he said. That’s exactly what Victorian woman and mother of three, Laura Marchese did. She bought a “dumb” phone for her 10-year-old son to carry when he walks home from school. “I don’t want him to have the world at his fingertips; a phone is in your pocket and he’s more likely to get it out and use it all the time,” she told the Herald Sunlast month. This entry was posted on May 4, 2015 at 10:12 pm and is filed under Uncategorized. You can follow any responses to this entry through the RSS 2.0 feed. You can leave a response, or trackback from your own site.